Focal SM9 review | What Hi-Fi? It’s clear from the appearance of the Focal SM9 speakers that these are no ordinary hi-fi speakers. Indeed, they are sold via Focal’s pro-division distributors (SCV Electronics in the UK) rather than the regular hi-fi dealer network. The SM9’s natural home is on a mixing desk where their squat proportions and unusual drive unit layout make sense. In a domestic listening room there’s no doubt they look a little odd, even a little aggressive. Take a look at the speaker and you’ll see four drive units. The top-end of the frequency range is taken care of by a 25mm inverted Beryllium dome tweeter, while the remaining trio of drive units use composite sandwich cones of 16.5cm, 20cm and 27cm diameters respectively. The largest of these units is upward facing, and turns out to be a passive radiator. It helps the dedicated bass driver to deliver weightier lows than otherwise would be the case. The Focal SM9s are active speakers. They have three power amplifiers per cabinet: the treble and midrange drivers are each driven by a 100 watt module, and a mighty 400W amplifier powers the bass driver – that’s some pretty hefty firepower. The amplifiers are conventional Class A/B designs rather than the increasingly common Class D option, because Focal thinks the traditional technology gives a better sound. Take a look around the back and you’ll see the hefty heatsink required to keep the internal electronics cool, and a series of controls that allow the user to fine tune the tonal balance for a particularly location. It’s important to get stands that raise the tweeter to ear height – and ones that have a top plate big enough to ensure the speakers are stable. The distributor supplied IsoAcoustics Argosy ISA-360i Spire stands (£375) with the speakers. These work well enough, but wouldn’t be acceptable domestically for most people. The Custom Design 104 Signature stands (£190) are closer to the mark, though the standard top plate is a bit too small for absolute security. The speakers are impressively flexible in terms of placement within a room. In our facilities a free-space position worked best, meaning we could bypass all the controls at the back and gain a little extra sonic clarity, refinement and precision in the process. We found that we had to sit around 80-100cm closer to the Focals than we would with a more conventional alternatives – their presentation is just better focused and more precise this way. 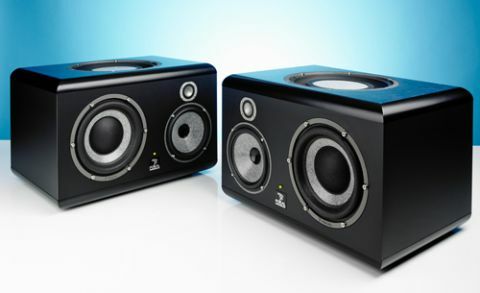 One of the Focal SM9’s biggest selling points (for studio work) is that it’s two speakers in one. As standard, it’s a true three-way design with a claimed frequency response of 30Hz - 40KHz (+/- 3dB). But press a little button on the side and the bass driver is disconnected, and the internal crossover changed, so that the remaining two drivers work as a conventional two-way design. In this configuration, the frequency response is restricted to 90Hz-20kHz (+/- 3dB). If you take a look inside the box you see that the tweeter and what is now a mid/bass unit are even partitioned off in their own enclosure. Why do this? Well, studios usually have two monitoring systems: a large one to check out full-range dynamics and the frequency extremes, and a small set of (bandwidth limited) monitors to hear what the recording sounds like through a portable radio or in a car. It’s important that the song is engineered to sound good through both set-ups. The Focal SM9’s two in one approach saves space and money in a studio environment. Does this feature have any use in the home? Well, yes. It works well for late night listening where you can’t use high volume levels and don’t really want loads of bass or massively wide dynamics in case the children or neighbours are disturbed. Most of our listening was done with the SM9s connected to our reference Bryston BP26 preamp via appropriately long lengths of balanced leads. Cyrus’s brand new DAC XP Signature provided able back up. The speaker’s analytical nature dictates that sources have to be top-class. Our usual Naim NDS/555ps did much of the work but was aided by Burmester’s mighty 069 CD player – both, but particularly the 069, worked brilliantly. The whole point of a studio monitor is analysis, and the SM9 certainly don’t disappoint. There’s a massive amount of insight here. Want to dissect the production of Kanye West’s Yeezus? These Focals will be happy to oblige, laying each instrumental strand bare. More than that, they deliver the leading and trail edges of notes with breathtaking precision, and have the kind of dynamic punch that is genuinely shocking provided the volume level is turned up. Composure at higher levels is deeply impressive, as is the listenability as volume goes up. These monitors are rated at 116dB (measured at 1m distance) – that’s very loud indeed. These Focals are relatively compact, but they sound impressively authoritative, and low notes dig deep and true. They certainly deal with complex bass tracks such as Nitin Sawhney’s Anthem Without Nation or Time from the Inception OST brilliantly. There’s more here than just muscle. The SM9s can convey the emotion in Nina Simone’s voice on Here Comes The Sun superbly, and deliver Arvo Part’s wonderful Tabula Rasa with all the delicacy and lightness of touch it deserves. Criticisms? The SM9s like to play loud. That’s when they come to life. At lower levels they lose a little too much bite and excitement for our tastes, and the bass performance loses impact. Other than that, the nature of their intended use means that the finish isn’t as luxurious as a comparable domestic alternative, even though build is as reassuring as you like. The SM9s may look out of place in domestic surroundings, but consider that their price includes 1.2 kW of power amplification and the kind of sound quality that most conventional alternatives at double the price would struggle to better. We have to conclude that the Focal SM9 speakers are a superb buy. We’ll certainly be sorry to see them go.